From left to right: Axalta All-Pro teachers Eric Turnbull, Brooks Twilley, Joe Dell’Arciprete, Heather Handler, Colleen Mooney, Robin McClean, the Stroud Center’s Dr. Steve Kerlin, Philadelphia Eagles Safety Chris Maragos, Dr. Javier Dominguez, Ross Cruz, Paul VanHouten, Anne Klein, and Michelle Fogel got hands on with macroinvertebrates in White Clay Creek. Axalta, a leading global supplier of liquid and powder coatings headquartered in Philadelphia, the World Champion Philadelphia Eagles, and Stroud Water Research Center hosted a day of STEM (science, technology, engineering and math) learning in White Clay Creek for recipients of Axalta’s All-Pro Teachers designation – a program in conjunction with the Eagles that identifies, recognizes and rewards innovative STEM-focused teachers and their schools in the greater Philadelphia area. 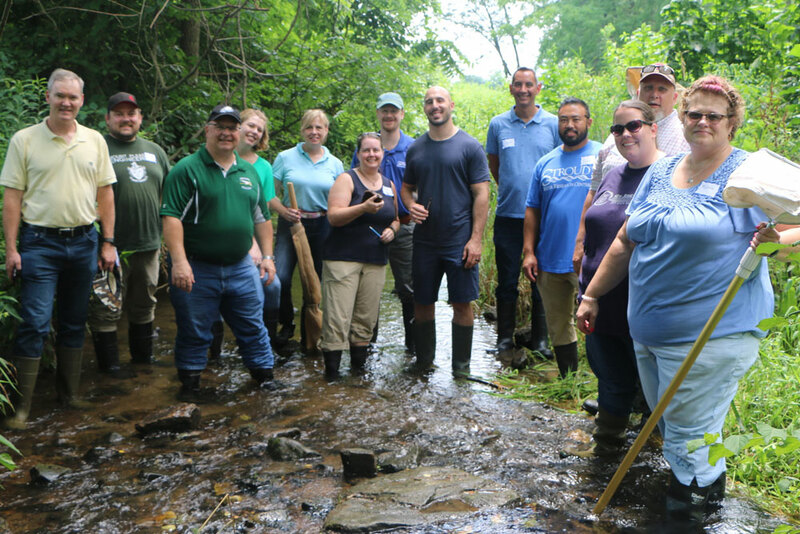 Throughout the day, teachers experienced STEM education in a real-world setting giving them the tools to cultivate the next generation of freshwater stewards. Activities included water chemistry and stream habitat assessments. The most popular activity was the opportunity for participants to get their boots wet and collect macroinvertebrates with Chris Maragos. Back in the lab, the teachers learned how Stroud Center scientists use macroinvertebrate identification to assess stream health and water quality. Partnering with the Chester County Intermediate Unit, the Stroud Center offered Act 48 Credits to all participants.